One day after posting (then deleting) a defiant response to his inexcusable actions at Belltor 187, Conor McGregor issued an apology on Tuesday. I sincerely apologize for my behavior at last weekends fight event in Dublin. While trying to support a loyal teammate and friend, I let my emotions get the best of me and acted out of line. As a multiple weight UFC champion, executive producer, role model and public figure, I must hold myself to a higher standard. The referee Marc Godard was making a horrendous decision in trying to pick an unconscious fighter up off the floor and force the fight to continue into the second round. Even against the wishes of the said fighters coach. The fight was over. After witnessing my fighter in a fight where the worst happened and the opponent passed away from his injuries on the night, I thought the worst was about to happen again, and I lost it and over reacted. I am sorry to everyone. I sincerely apologize to the Director of the Mohegan Tribe Department of Athletic Regulation, Mike Mazzulli, all the officials and staff working the event, Andy Ryan and his fighter John, two stonch ones that put up a great fight every time. That side will always have my respect, and lastly every one of my fans. I love yous all! I’ve always learned from my mistakes and this will be no different. This is a far different response than what McGregor offered Monday via Twitter. In case you missed it, McGregor was sitting cageside at Bellator 187 inside 3Arena in his backyard of Dublin Friday supporting his fellow SGB Ireland teammate Charlie Ward. After watching Ward unleash a vicious 1stRound TKO victory over John Redmond, McGregor rushed inside the cage in excitement despite not being a licensed cornerman. McGregor then shoved referee Marc Goddard and started screaming at him, while a battered Redmond was trying to regain his senses by McGregor’s feet. McGregor had to be physically removed from the cage. In today’s apology, McGregor is referencing last April’s tragic death of Ireland’s Joao Carvalho. Carvelho passed away just 48 hours after suffering a knockout loss to Ward in Dublin. That may or may not be a legitimate reason for McGregor’s assault on Goddard, but he fails to explain why he slapped a commissioner in the face moments later when he was stopped from jumping the cage to continue his celebration with Ward. 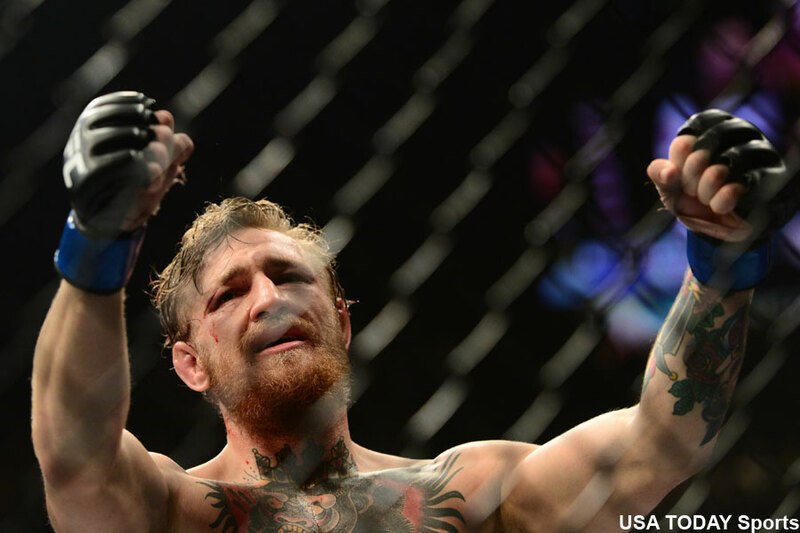 Conor McGregor also slapped a commissioner tonight as he was told to get down from the cage. Not good. Association of Boxing Commissions president Mike Mazzulli, who served as the director of the Mohegan Tribe Department of Athletic Regulation for the event, is currently evaluating his legal options against McGregor. The UFC has yet to publicly address McGregor’s actions, but Mazzulli claims they have dealt with their lightweight champion behind the scenes. Mazzulli said on The MMA Hour that the UFC told him they have pulled McGregor from their end of the year bash on December 30. You can take the “punishment” with a grain of salt, because McGregor was not scheduled to appear in the event anyway.